Kevin Gunstone and Slobodan Jovanovic aren't quite household names, but Markosia Enterprises is looking to change that later this month. How? By printing Future Primitive, chronicling the story of a timeless Earth transformed by supernova radiation. The digital first title on Comixology has drawn rave reviews. It features colors by Stefan Mrkonjic and Matteo Baldrighi, and lettering and design by Patrick Foster. Markosia Enterprises are delighted to announce the February print publication of the award-nominated digital series FUTURE PRIMITIVE, with a special limited edition hardback set to debut at this year’s London Super Comic Convention. The book is written by former Image and Marvel creator Kevin Gunstone; with art by rising talent Slobodan Jovanovic, colours by Stefan Mrkonjic and Matteo Baldrighi, and lettering and design by Patrick Foster. FUTURE PRIMITIVE is published by Markosia Enterprises and will be offered as a limited edition hardback at LSCC where Gunstone will be signing copies on both days. 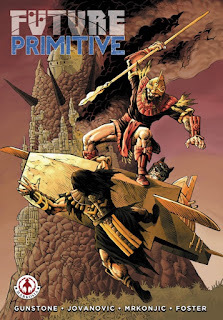 FUTURE PRIMITIVE is also available through Comixology and other digital outlets.